Closing press conference of the regional synod 2019. Fiona Paulus, co-president of the youth synod and vice-chair of Evangelical Youth in the Rhineland (EJiR), summed up events positively. President Manfred Rekowski, serving together with Paulus at the head of the youth synod, also gave a positive review of the week. The five resolutions of the youth synod – a “premiere” as Rekowski called it in the run-up to the meeting – had found their way into the regional synod. There were clear intersections between the concerns of the young people and that which was relevant for the Church, the president explained at the closing press conference of the regional synod 2019. With its resolution on new parish forms, the regional synod, with a tailwind from the younger generation, had “put concrete changes into motion”. In practical terms the current resolution addresses the financial question: All together the regional synod 2019 is making available around 12 million euro in the coming ten years to support innovative projects in the area of Christian communities and new forms of parish life. When asked for a prognosis of how the Rhineland Church would look in ten years, Rekowski said that the membership base would certainly be narrower due to demographic changes over which one had no control. But he added, “I am certain that we will be more diverse and more agile.” Even if not in a quantitative way, he said “local church congregations will surpass themselves”, in the sense that they would involve more people who already belong to the Church, more actively in what the Church was doing, especially people between the ages of 14 and 28. Among other questions, members of the media asked about the resolution on distribution of church tax and financial equalization among the church districts. 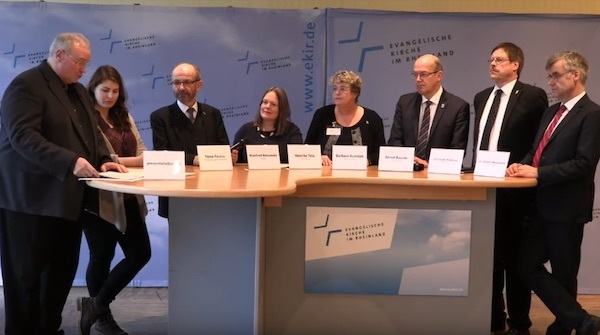 Financial equalization up to the present day had already to a large extent happened in solidarity, explained Executive Minister Bernd Baucks, head of the regional church office’s Department of Finance and Diakonia. With the planned incremental steps to increase financial equalization, solidarity would continue to grow between contributing and receiving church districts, he said.